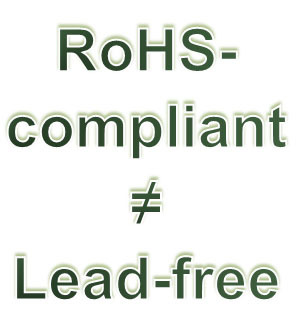 In practice, RoHS-compliant is often equated with “lead-free”. However, this is a widespread mistake. The RoHS directive 2002/95/EC aims to minimize the use of hazardous substances (including, among others, lead), but it does not completely exclude a small percentage. One of the great obstacles in implementing the directive was the switchover to lead-free solder, because the limit values (0.1 per cent by weight of the inseparable components) do not admit a lead solder. This is probably the most important reason for the mix-up/equating that comes up again and again.